Born in La Piedad, Michoacan in 1917. When he was only 3 months old and having three older sisters who were nuns, his family escaped the cristero war and found refuge in Guadalajara, Jalisco. A student of Chucho Reyes at his improvised art school, he became a member of the group "Pintores Jovenes de Jalisco". Servin worked with Jose Clemente Orozco making several murals in and around Guadalajara. His first grand exhibition was held in 1940 in Guadalajara, and he held many other shows after that in Mexico, Panama, Venezuela, the US and Europe. He is mentioned in a Time article from Oct 2 1944 written about the art of Jesus Reyes Ferreira. 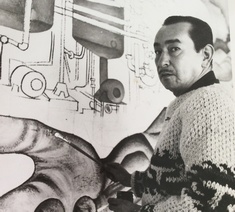 A professor at the University of Arizona for 15 years, he also made several murals in Phoenix, Tijuana and Monterrey.